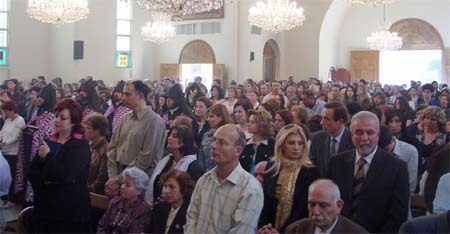 The Cathedral is already crowded when I make my way to join the Armenian clergy at the front for the Good Friday burial liturgy beginning at 4 p.m. A large catafalque has been erected in the centre of the Tas, the main floor chancel area in front of the raised sanctuary bema, representing the tomb. The burial liturgy picks up the story of the death of Jesus where it left off at the end of the service of readings in the morning. 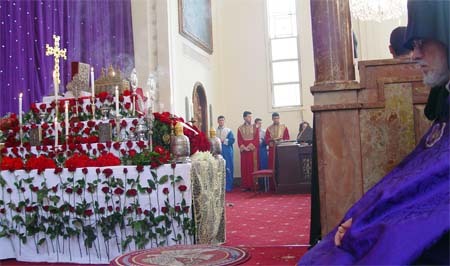 From 7 to 9 a.m. the story of the trial, torture, and crucifixion was read, as always with the readings set in bouquets of Armenian chant and psalmody. Now it is time for Joseph of Arimathea to ask for the body of his friend and teacher. Jesus will be taken down from the cross and laid to rest in a freshly hewn tomb. The first stage in this action is the taking down of the Lord's lifeless body from the cross, where his modern day followers kneel in deep mourning. His Holiness intones a hymn which tradition attributes to Joseph of Arimathea, when he comes to the cross to claim the body of Jesus. 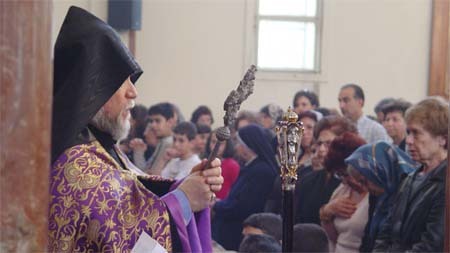 The deep bass voice of the Catholicos seems particularly appropriate for this lament. This is the only time in the office liturgies when the monks remove the velar, their pointed hood for the duration of the lament. Also, it is the one service when his Holiness does not wear the emblem of his office, a large golden eagle pendant. Then the body is carried from Calvary to the freshly hewn tomb in a nearby garden. 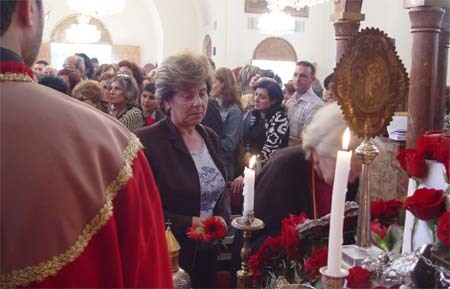 In the city churches today, a coffin filled with flowers is carried in procession through the streets, but at the Catholicosate, a simple procession is formed and makes its way through the congregation gathered at the Cathedral. Click here for a short film (6MB) from the beginning of the procession. 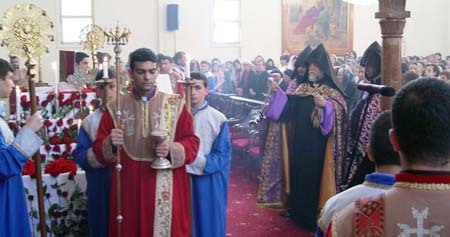 The procession moves slowly through the packed Cathedral, while the faithful close enough to do so, reverence the hand cross the Catholicos is carrying with a kiss. 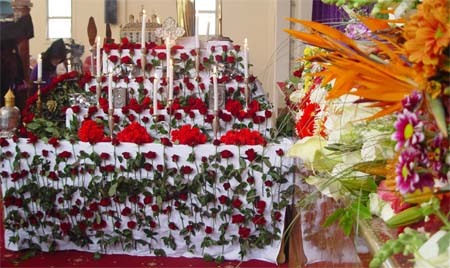 The beloved body is then symbolically placed in the tomb with prayers and a series of beautiful chants sung antiphonally from one choir of deacons to the other, on either side of the catafalque. His Holiness addresses the congregation and later summarizes his message for me. "I told them that before the Cross, communication between humanity and God was all one-way ... God revealing himself to us. The Son of God had to come and pay a terrible price to break through the barrier of sin that prevented our movement towards God. This action of Christ's on the Cross is a continuous event, and being Christian means participating in this on-going event and wading our way through the suffering and death, the trials and tribulations of this life, following the path Christ has blazed before us, towards the glorious resurrection that awaits." 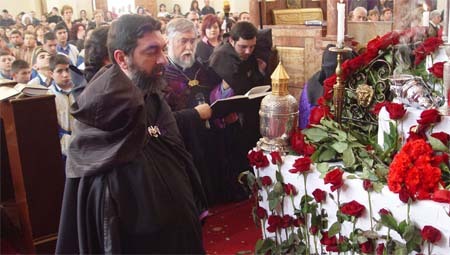 To conclude the burial liturgy, the Catholicos lifts the true relic of the cross, in the possession of the Catholicosate for hundreds of years, and blesses the congregation. Then begins one of the principle activities of the day. 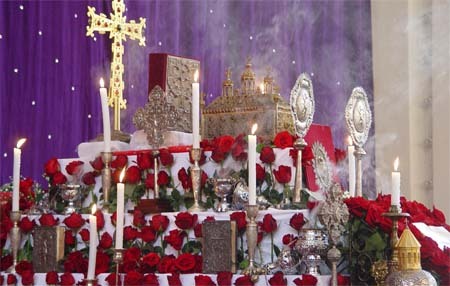 One by one the faithful come to the catafalque to pay their respects, reverencing the Gospel Book and the true relic of the Holy Cross ... and housands will do so in the course of the night. They bring flowers to lay beside the tomb, and receive flowers to take home ... as would a member of the family at a funeral today. Throughout the evening and well into the night, the youth of Lebanon's Christian communities (from every denomination) go about the tradition of visiting seven local churches, crawling underneath the tomb in each. At the Catholicosate, the linen side panels of the catafalque are raised so that they can pass through.